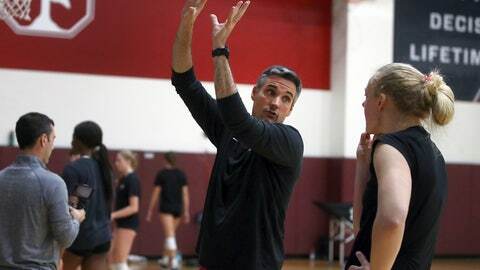 STANFORD, Calif. (AP) — Every practice, Kevin Hambly writes out his Stanford volleyball starting lineup on the white board — just so there’s no question, even though the women usually have a pretty good idea already. If they miss a serve during drills, Hambly calls for another one, an easy one — just to keep things going and to get the needed repetition before moving on. His laid-back team may tease him for it, yet Hambly’s players also greatly appreciate the second-year coach’s preparation style that contrasts their silliness. He just won Pac-12 Coach of the Year, too. Hambly arrived on The Farm from Illinois before last season accustomed to packed arenas for volleyball around the Big Ten — 8,000 at Nebraska, 7,000 at Wisconsin, nearly 5,000 at Minnesota — and he realizes the Pac-12 may never have that same following but has high hopes of boosting volleyball’s profile on the West Coast as he puts his mark on the storied Stanford program. With Gray, two-time reigning Pac-12 Player of the Year Kathryn Plummer and two-time conference Libero of the Year Morgan Hentz leading the way, Stanford is riding a 26-game winning streak and just completed a 20-0 run through Pac-12 play to become the conference’s first undefeated team since USC in 2003. Hambly is in a rhythm with this group having had more than a full year with his team. After taking the job in early 2017, more than half of the women were in their beach volleyball season and didn’t get significant time back indoors with Hambly until May. Now, they’re all on a roll and have a comfort level together. Still, Stanford hardly could have expected the perfect record in Pac-12 play. After last season ended, Stanford identified ways to better communicate and deal with confrontation — not to mention playing better defense. Once when a television analyst made reference to a “junior high dump” by Gray, Hambly had a little fun with it later.